Kombi tours in beautiful Byron Bay and the Northern Rivers... could there be a bigger treat and lifetime memory? Make sure to turn heads on arrival with the splitty and thrill onlookers...take a trip back in history and it will be one you will never forget!!! The Kombi has been at the centre of popular cultures for decades and has caught the attention of musicians, film makers and free loving hippies as a vehicle with a unique sense of charm. Do you have a special occasion that you would like to celebrate with style? Whether it is a wedding or a school formal that needs to be unforgettable-a cruise in one of our beautifully restored kombis is the perfect transport to make the day fabulously special. So why settle for a car with ribbons if you could go with the coolest of styles? Nothing but the best will do on your special day. Choose between ´Granny´- a classy cream coloured beauty from 1958 or ´Peppy´- a pastel-mint coloured, nostalgic ride from 1967... And they are both dressed up with flowers and ribbons on your special day!! We do really want you to have an epic day - so just tell us about your ideas and we´ll try our utmost to make it happen! These days every bride and groom wants a wedding day they will never forget. The first dance has to be the most imaginable, the dance moves must make Travolta envious. The cake must be ten times bigger, and tastier, the little figurines modelled to scale, brides are skydiving and grooms are galloping into the church on a white stallion. People are constantly improving the ideal wedding day. How about this for something off the beaten track with enough wow factor and "aww cute" usually only reserved for kittens. Kombi weddings. There are millions of fans worldwide of the iconic VW Kombi. It talks of a time when love was true and real, and romance meant driving off into the sunset on great adventures with the person of your dreams. Originally named the "Type 2" and released in 1949 it was the second model of a car made by Volkswagen, the first being the "Type 1", also known as the Beetle. One of the forerunners of the modern cargo and passenger vans, Volkswagen is one of the most iconic manufacturers in the world. It has been making vans for more than sixty years and has produced many vehicles over the years which have confirmed their popularity and reliability time and time again. A classic time piece, the VW Kombi gets it name from the German word Kombinationskraftwagen which means a combined-use vehicle, but it has earned various nicknames worldwide. In Mexico, the German Kombi was translated as Combi and became renowned in the capital thanks to the public transport system. In Portugal it is called the Pao-de-forma which means Breadloaf because its design resembles bread baked in a mould. In America, its fans call it a VW Bus, Hippie Van, or Transporter. The early versions produced before 1967 used a split front windshield and their comparative rarity has led to them becoming well sought after by collectors. The VW Kombi is a much loved symbol whose popularity is not waning anytime soon and that is only part of what makes our kombi weddings so endearing and memorable. The same can also be said for Byron Bay, a beachside town located in the far north eastern corner of New South Wales. The town was named after John Byron who was lucky enough to circumnavigate of the world and who was the grandfather of the poet Lord Byron. The town is popular for surfing, skydiving, whale-watching and is a bit of a mecca for backpackers, Boho-lovers and intrepid travellers. People sometimes wonder what it is about Byron Bay that makes it such a timeless place for locals and tourists alike. Some say it is just simply the vibe. This is why the VW Kombi and Byron Bay make for such a great marriage, both iconic partners who speak of times gone by and whispers hope of future's fantasy. Although Byron Bay Kombis cater for all sorts of occasions it is especially weddings that fit perfectly into the theme of classic longevity, and makes the kombi Byron Bay combination a must. Weddings through out time have had some traditions that have stayed the course while some have waned. The tradition of wearing a wedding ring on the fourth finger of the left hand is because it was once thought that a vein in that finger led directly to the heart. While diamonds and gold seem to be the most popular in the western world, in the symbolic language of jewellery a sapphire or an aquamarine in a wedding ring means marital happiness, while apparently a pearl engagement ring is said to be bad luck because its shape echoes that of a tear. Queen Victoria started the trend of the white wedding dress in 1840. Before then western brides simply wore their best dress. In Japan wearing white was always the colour of choice. The ancient Greeks and Romans thought the veil protected the bride from evil spirits, a trend that continues to this day. In Asia wearing a dress with embroidered cranes symbolizes fidelity. According to Hindu culture rain on your wedding day is a sign of good luck. In Egypt, women pinch the bride on her wedding day for good luck, and apparently Czech newly-weds get peas thrown at them rather than rice. Each culture has something to call their own and in these modern times weddings are tailored to a more individual expression which brings us back to the kombi Byron Bay weddings. About Byron Bay Weddings Tripping along the Byron Bay and the Northern Rivers is pretty mesmerising in itself but add the traditional ride of the VW Kombi and the bridal party is sure to be transported into a time capsule of class and nostalgia. A kombi hire Byron Bay mix is a must. Everyone says love is not a smooth ride but a wedding like this will be the best start to a romantic adventure, with Byron Bay Kombi's self styled purpose-built Kombis. People these days hardly give a wedding procession a second look but a wedding event like this is sure to turn heads and even make one or two hippies swoon with memories of days gone by. The Kombi has been a centre of many trendy and hip popular cultures for several decades and it has captivated musicians and film producers and their like. This superior and fun wedding transport service is accessible across all of Australia. The kombi hire Byron Bay also do bespoke designs of decorations according to the whims and wishes of their beloved customers. They cater for many occasions, from formal school trips to friend's reunions. A big draw when it comes to the kombi wedding hire is that for once the entire bridal party can travel together and with the iconic VW windows guests can see the happy couple bonding. A far cry from a limo or other car that keeps the lovebirds mostly hidden. A big part of the day is being with all the friends and family and all too often the couple find themselves cut off from the people that mean the most to them. The two Kombis that are available for the kombi wedding hire have two distinct and alluring pastel colours that are a perfect reflection of a wedding tone and character. There is a charming “Granny” and an appealing “Peppy”. Granny the Classic Love 58! Granny is the endearing name of this classic 1958 built Kombi. Elegance and grace coupled with comfort and classic prestige: this is the granny who still rocks her funky chic outfits and does her hair every day, not the granny who lives in tracksuit bottoms and spills biscuit crumbs everywhere. In a chic cream colour this is the type of transportation that will not clash with the bride's colour scheme. We are also more than happy to decorate either Kombi with bright flowers and ribbons. Granny has been beautifully restored. The engine was in a good condition at the time it was purchased but the outer covering needed some touching up. Considering it was built in 1958 the amount of rusting has been slight. It was much loved and cared for by its previous owner and that continues this present day for a kombi van hire wedding. Long term love, care and affection, the perfect vibe for a wedding party to be a part of. The Granny is a right-hand drive and its originality is kept to true form. The Granny's number plate reads “58 Love”. Peppy- The Mint Love 68 Peppy has an attractive pastel mint shade. This Kombi speaks of the nostalgia back in 1967 and has a more Bohemian vibe that can stand out while not outshining the bride. Open to decoration and personal touches for the special day, Peppy is the latest addition to the Kombi family. Her distinguishing feature is the rounded windows on the back, perfect for those cool and chic wedding photos. A left hand drive, Peppy is ready to carry the newly-weds past delightful and stunning scenery. It oozes classic panache, "the summer of love", and even the emblem of the VW speaks of a circle within, in which all that has meaning to you is cherished. Peppy's number plate reads “68 Love”. Byron Bay Wedding Car Hire The wedding kombi hire service is delighted to help you customise your wedding day vehicle. We greatly value the input of our customers and their comments and suggestions have enabled us to provide such a memorable and popular service. Eskies- Refreshing Drinks for the Journey Byron Bay’s Kombis carry portable Esky coolers. These iceboxes are the best for serving chilled and icy drinks to the passengers. There is also an option to add your own best beverages. Kombis with a Sound System If music be the food of love, play on. Our kombi van hire Byron Bay vehicles have a superior quality sound system installed in them. Couples can listen to the playlist that reminds them of when they first met, or if they choose they could play the type of music that will get the wedding party dancing the minute they arrive at their destination. For those needing some serene calmness after the hectic preparations leading up to the day, classical music can sooth those busy minds. Dynamic duo Alex and Brita are the go-to guys in Byron Bay. Alex is the expert mechanic who will ensure there is no bumpy ride on your big day, while Brita is renowned for her smooth navigating. Your smile matters to these earnest romantics. Their aim is utmost satisfaction and their game is unmatchable service. A classically styled Volkswagen Kombi, decorated with wedding ribbons, balloons, flowers or ‘just married’ signs, the sky is the limit with what you can do to personalise your ride on your wedding day. Granny and Peppy come with decorative ribbons at the front in the colours of your choice to match a specific wedding theme, and you can also add glorious floral arrangements to personalise your wedding chariot. The VW Kombi is one of those great kombi wedding cars for romantic transportation. Not only do we provide a chauffeur service, we will happily stay around and allow plenty of time for your wedding photographs. These stylishly refurbished VW kombis are fabulously photogenic and make a great photo prop that you can take with you into almost any setting. These stylish retro vehicles can be a great addition to a vintage or rustic-themed wedding. They can be as understated or flamboyant as you want. Just say the word. It can also be used to make some gorgeous bride and groom snaps in a lovely outdoor Byron Bay location, or fit in all the bridesmaids and organise a mini photo shoot on the way to the ceremony venue. How to Reach Us? 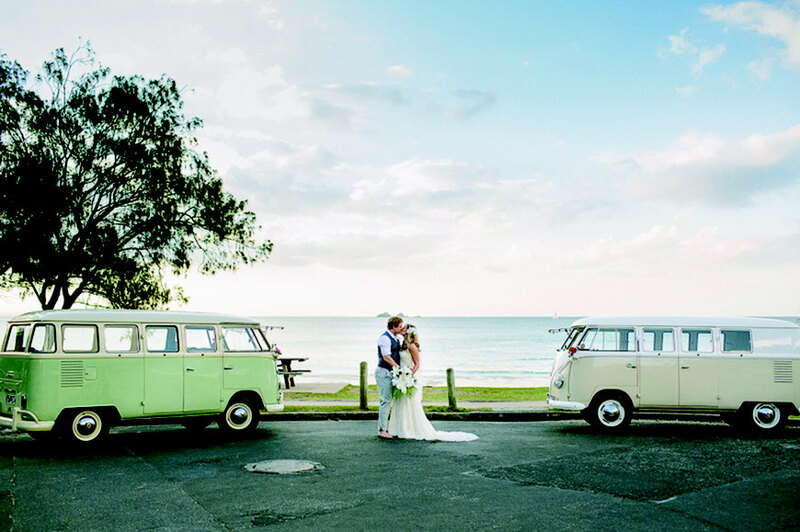 A Byron Bay kombi van wedding hire is easy to achieve. Bookings can be made online and we welcome any suggestions and feedback from our potential clients. Before you can say the word “Volkswagen”, you will receive our prompt reply. A detailed PDF file can be downloaded from our web page in order to read and understand all terms and conditions before contracting wedding car hire Byron Bay service. If you have any questions that need to be answered in more detail, call 0421 135 477 or drop us a message online at info@byronbaykombis.com.au Your wedding day is a day that will be remembered for the rest of your life. The good and the bad, but whether your cousin twice removed falls into the punch bowl or the tiniest bridesmaid refuses to carry flowers, be assured that everything that is in our power to make your time special, will be achieved. When one of your guests catches the bouquet they might ask to also have our business card in their hand we are that confident that our service will speak for itself. We have been awarded for having Byron Bay's best fleet of maintained Kombis. We are proud of this success and we always aim to deliver quality. You can leave your dream in our hands. We will make your special day one of your most precious memories. If you have not heard about us before, please read the testimonials written about us by numerous satisfied customers that have had an enjoyable experience on our kombis. Nothing better than word of mouth. See you soon lovebirds. carry portable coolers. The brand is popularly known as an “Esky” in Australia. The iceboxes are best used for serving chilled and icy drinks to the passengers. The commuters are given a choice to add their own drinks too. With eskies the passengers can enjoy the travel with some refrigerated drinks and snacks. • Kombis With a Sound System In addition to the snacking option, our Kombis have superior quality sound system installed in them. Music makes the drive a little more romantic, exhilarating and amusing. Music is a source of pleasure and indulgence for all sorts of ceremonies and occasions but weddings are one special event that will be incomplete without music. A nice sound system installed in our kombis is a lovely addition to the conventional styled vehicle. Don’t these Kombis offer an exciting package altogether? With the graceful and classic Granny and Peppy romance is in the air for our newly wedded couples. Alex and Brita Volkswagens are an all in all passion for us at Byron Bay, particularly for Alex and Brita. Alex is an expert who wouldn´t mind devoting his time and effort in fixing the vehicle if it needs any repairs for maintenance. Brita, on the contrary, is fond of driving the beauties rather than working on repairs. Alex and Brita will make sure that your special wedding day is not disturbed in any way. Troubles and any sort of glitches during a tour can be a very unpleasant experience because you wedding day is one of the most special and much awaited days of your life and no one wants any problems on that day. Our properly maintained Volkswagens are our fantasy vehicles, which will ensure that we provide you with our unmatchable service so you remember the utmost experience with us for all times to come. Your smiles matter to us. Our aim is to satisfy our most revered clients by giving them a chance to give a personal touch to your wedding. A personal touch is an absolute essential part of weddings nowadays. How To Reach Us? Hiring a Byron Bay wedding car is just to easy for all our clients. Booking can be made online with little or almost no inconvenience. Furthermore, we welcome any suggestions and feedback from our potential clients. You can write to us in detail about all the queries and we will respond to you in no time. Before you can even say the word “Volkswagen”, you’ll receive our prompt reply. A detailed PDF file can be downloaded from our web page in order to read and understand all terms and conditions before actually contracting wedding car hire Byron Bay service. This is to make sure that our customers are well versed in the details of the contract. If you have any more questions that need to be considered in much detail, then we can discuss those over the telephone. For contact, call 0421 135 477 or drop us a message online at info@coast58.com.au In A Nutshell There is only one wedding day, but its memories stick to you for all times to come. Like everyone else, you also desire to hold on to such pleasure filled days. For this special day, you make plans and maintain a diary log of all the little things you want on your wedding day. For perfection, we at Byron Bay wedding, our Kombis provide a smooth, swift and comfy ride to the venue. Besides a comfy ride to the wedding ceremonial location, we also make sure our passengers have a fulfilling experience and spread the words about us to their near and dear ones. If you haven’t heard about us from someone, then have a read about the testimonials written about us by numerous pleased and contented customers that have had an enjoyable experience on your kombis. The two kombis we offer are perfect for wedding and engagement events. They can be decorated with flowers of ribbons, just according to the instructions of our customers. After all it is their special event and therefore, their input is what matters most to us at Byron Bay weddings. To try something unique and creative for your wedding is not a bad idea. So a classic Volkswagen from late 1950’s and 1960’s sure is an interesting idea, which has been brought into reality today with our Kombis. The Kombis are in pastel mint green color and in a cream color named as Peppy and Granny respectively. You can choose a right hand drive or a left hand drive as per your own choice. We have both options available with us. We are awarded for being having a fleet of the best-maintained kombis and this success is a matter of pride for us but that is not our basic aim. We aim to deliver higher quality and to continue to improve and upgrading our services. Since nothing is more valuable to us, our priority is our most venerated customers, let us take care and responsibilities of all the complicated details of your desired wedding while you relax in your home. When we take over charge for your conveyance, you have nothing to worry about. Trust us, we will never let you down because honesty, reliability and integrity are our foremost priority and we deliver it to the fullest. Book a date with us and we will quickly respond to you without any delay. Your smile is our achievement! Have a nice trip on one of our Kombis, to your beach wedding or reception and make it exclusive, fun, memorable and classy!